This summer, Laudamotion will operate four bases, growing Vienna from four to eight aircraft, Dusseldorf 7 aircraft, Stuttgart 3 aircraft, and Palma 2 aircraft. This winter, the Vienna base will increase to 11 aircraft, making Laudamotion its number two airline, just behind Austrian Airlines. Airline to create up to 400 jobs for pilots, cabin crew, and engineers across its four bases. Ryanair revealed it completed the purchase of a 100pc shareholding in Laudamotion from NL Holdings in late December. Laudamotion now becomes a full subsidiary of Ryanair Holdings Plc, Ryanair’s parent group. 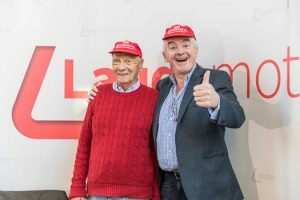 Laudamotion, founded by Formula 1 racing legend Niki Lauda, commenced services between Dublin and Vienna last October and is now set to increase its fleet from 19 to 25 this summer. Ryanair took an initial 24.9pc stake in Laudamotion in March 2018, and said at the time it aimed to boost that to 75pc subject to approval by the EU Competition Authority, which was later achieved. Laudamotion has now signed LOI agreements with a number of lessors which will increase its Summer ’20 fleet to 30 – all Airbus – aircraft. It aims to grow its traffic from 4m guests in year 1 to 6m guests in year 2 (FY March 2020) to 7.5m guests in FY March 2021. Laudamotion’s Deputy CEO, Colin Casey, said: “We are currently negotiating new routes and handling agreements with more than 50 new airports, all of whom want to share in Laudamotion’s exciting growth plans for the coming years. As other airlines falter, close bases or put themselves up for sale (as in the case of Germania recently), we are inundated with applications from pilots and cabin crew who wish to join Austria’s No.1 low fares airline as we embark on exciting growth plans, not just in Austria and Germany, but in other new countries as well.